Michigan Movies and More | Stalking movies in Michigan. 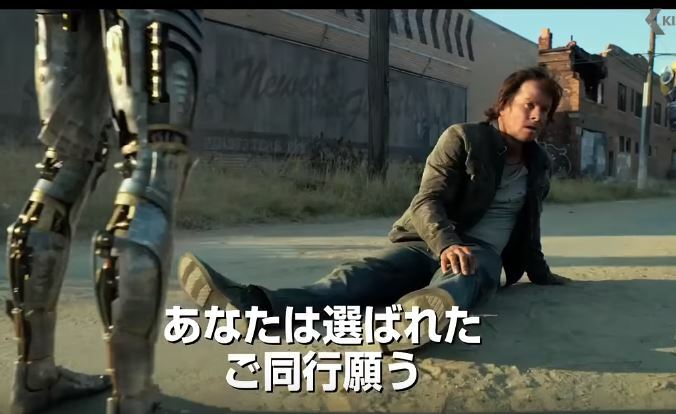 Another screen shot from the last trailer. 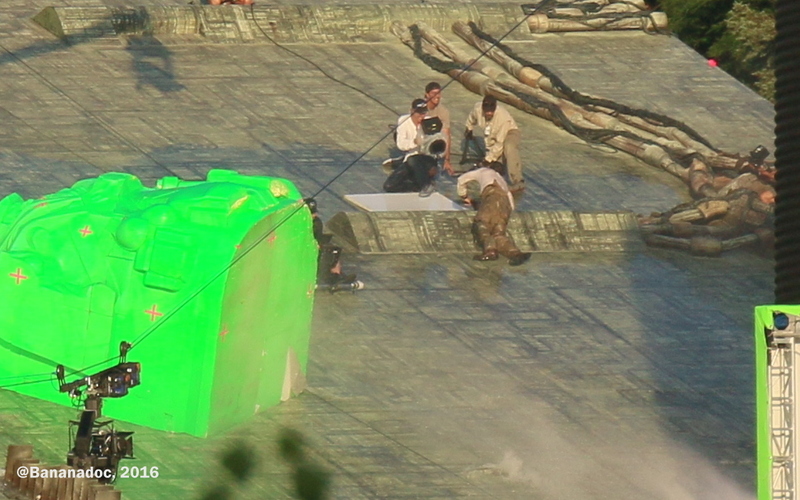 I’m pretty sure that Mark and co-star Laura Haddock are here inside the submarine. If anyone remembers the time the production went to the south coast of the UK to film in a naval yard, where this submarine is housed. 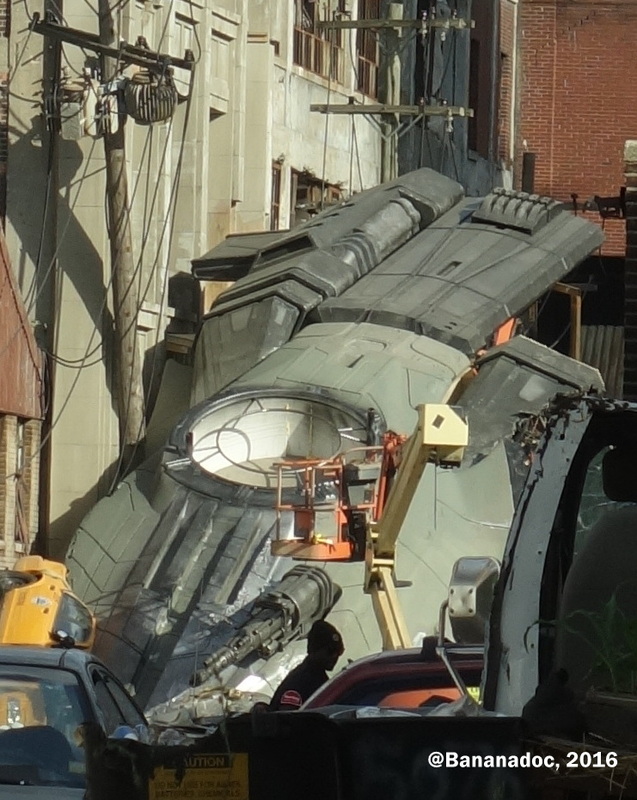 I was pretty pleased with myself when I noticed that this submarine looked remarkably like a set I had seen in the backlot of the Pontiac studios. 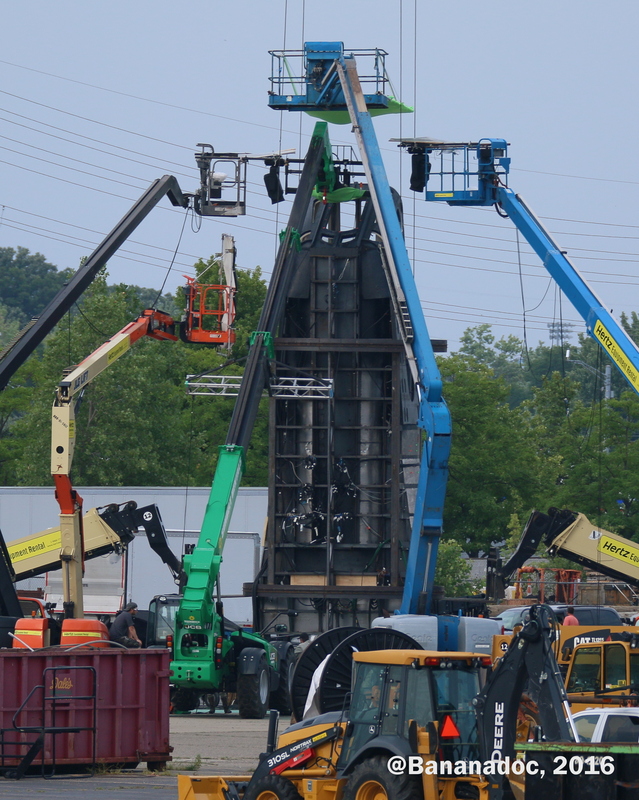 When I first saw it I thought it was a rocket of some kind, but then I saw the markings and it all began to fit into place. 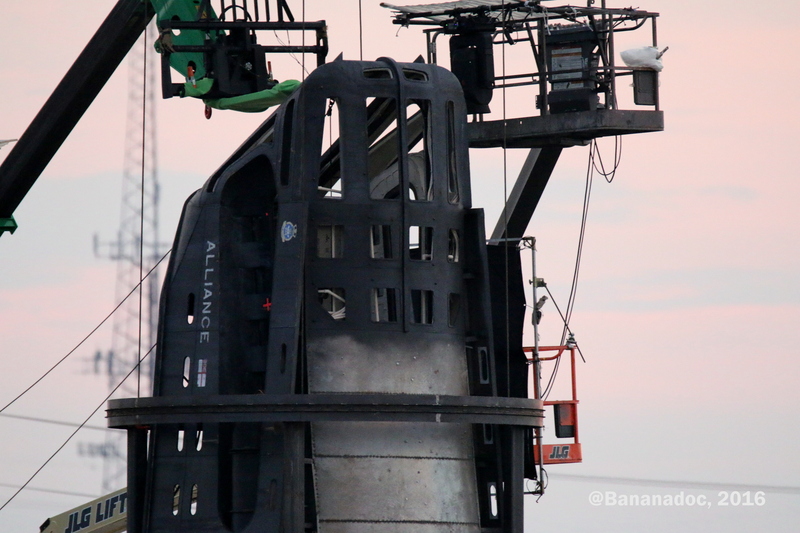 There is clearly the word Alliance, and a British Royal Navy crest. My previous post on this is here. Screen shots from the latest trailer. I include these because they answer a small mystery. 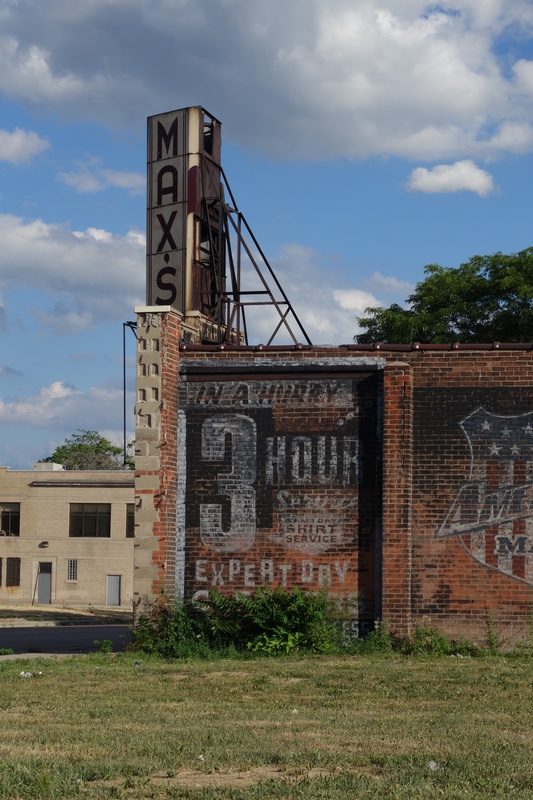 A couple of sources posted some shots of a street on the east side of Detroit where the buildings had clearly been made to look different with logos and posters on them. At the time there was speculation that this may have been for the Detroit Riots movie (https://www.metrotimes.com/the-scene/archives/2016/08/01/psst-these-might-be-the-first-signs-of-kathryn-bigelows-1967-flick-in-detroit). But here they are in this shot. The location is Chene just south if the Ford freeway. They filmed a few scenes here in June. 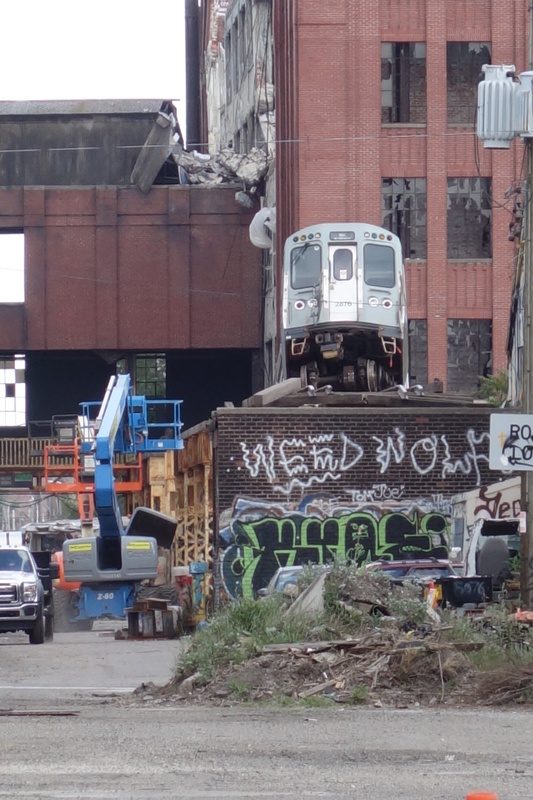 By the time we spotted this ‘set,’ there were no other signs of filming. 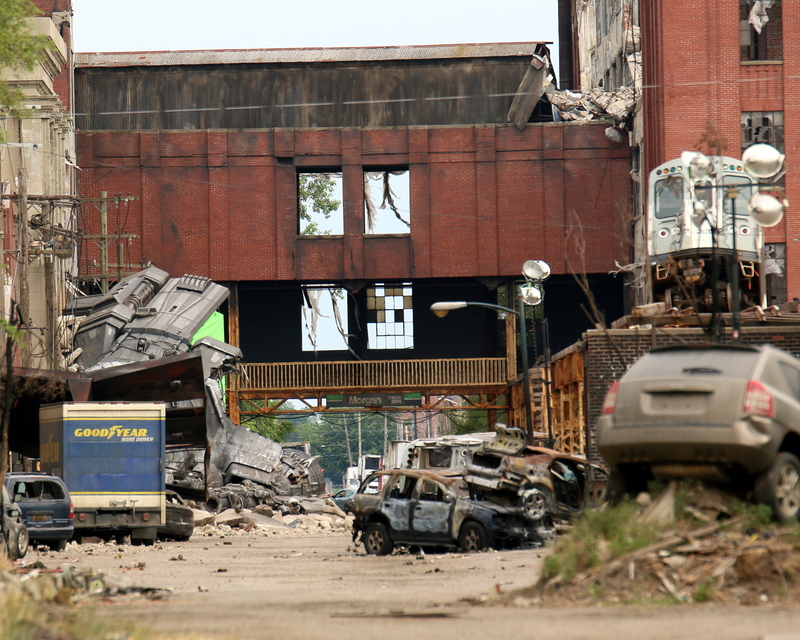 And our hopes that the Detroit Riots movie woudl come to Detroit were pretty much in vain. 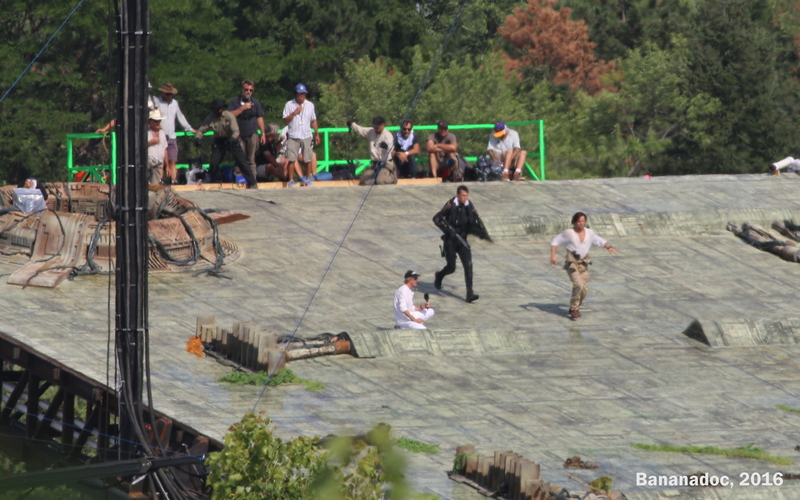 Still on the raised platform, Duhamel and Wahlberg’s stunt doubles run up and down and then get really, really wet. The scene from the trailer shows how it fits in the movie. 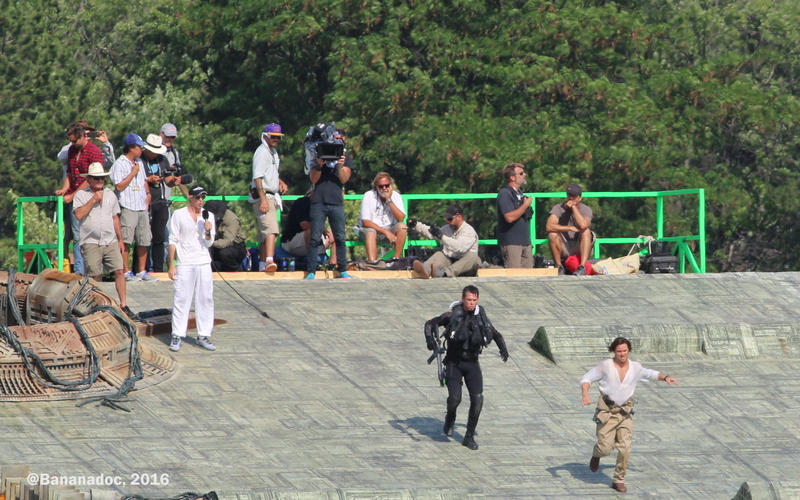 I can tell the shot is Wahlberg’s stunt double because I spent so many hours watching him from every angle. 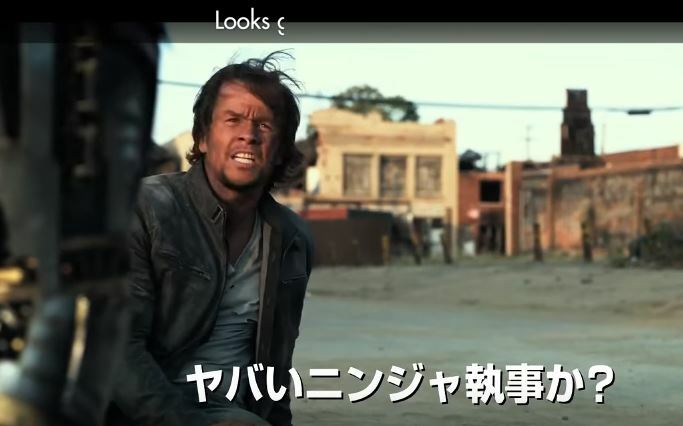 Of course this is Michael Bay we are talking about, so of course there were explosions. These are still the stunt doubles, but watch the price that cameraman pays at the bottom left! That’s dedication to his craft. 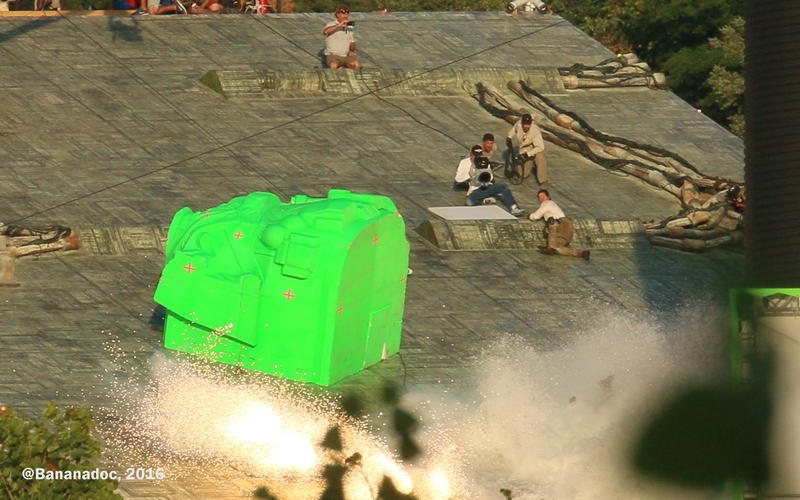 Still on the platform, a long day of filming, and yet more Michael Bay pyrotechnics. 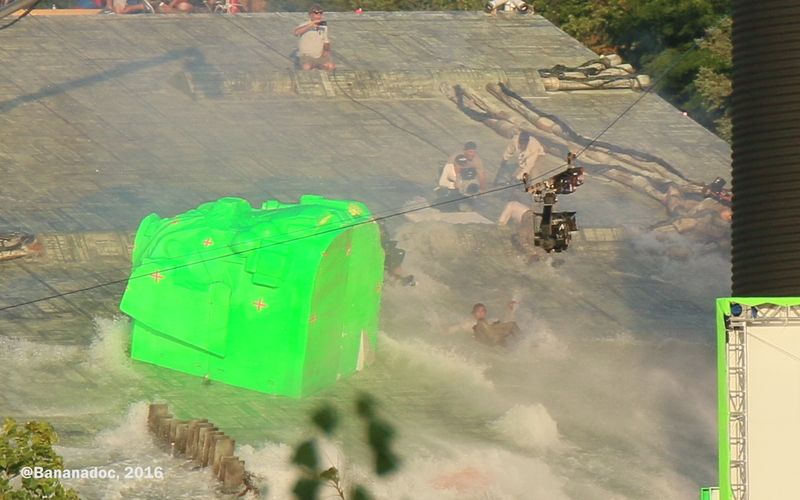 Here they are doing the close-up shots of Mark, while his stunt double does the really dangerous stuff and is swept down and off the platform in a huge wave of water. 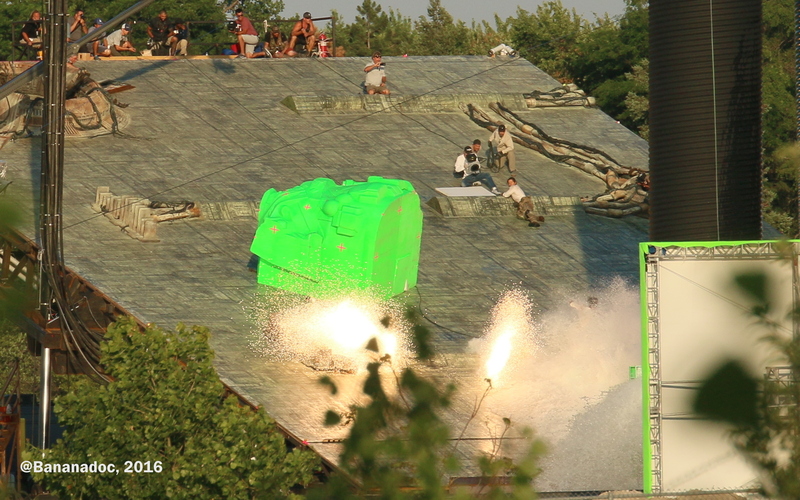 Follow the sequence and watch the poor stunt double get wiped out! 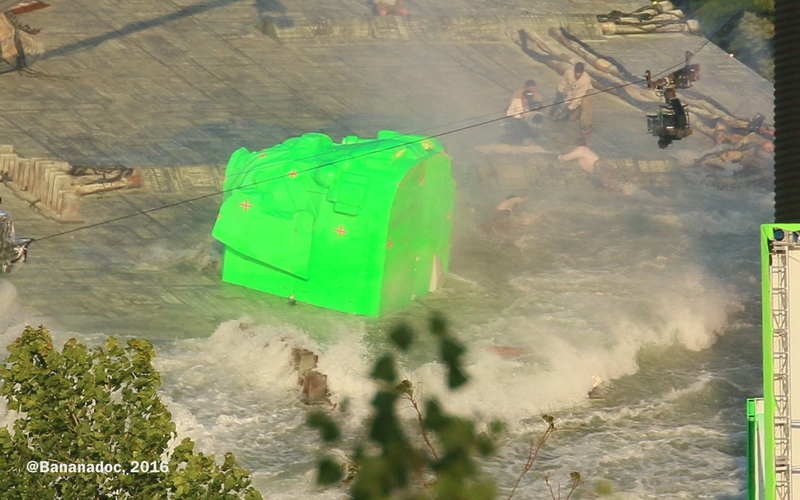 That’s not to say this was all fun and games for Mark who still gets pretty wet over several takes. Well it’s hard to come up with different, snappier titles! Last post we were watching the platform lift up. 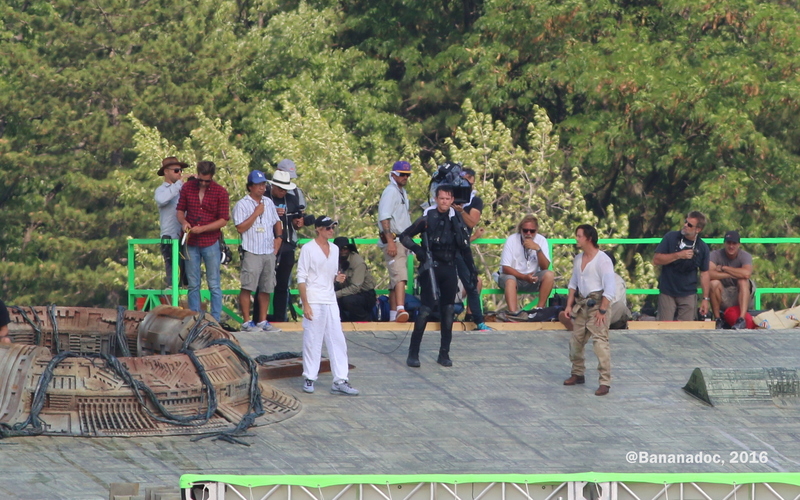 Michael Bay was surveying the set and stunt Mark Wahlberg was in position. For reference, I’m these scenes relate to these scenes in the trailers. The giant ship is coming out of the ocean and fights ensue on the watery deck. See below. So next time I look up there are two Mark Wahlbergs. 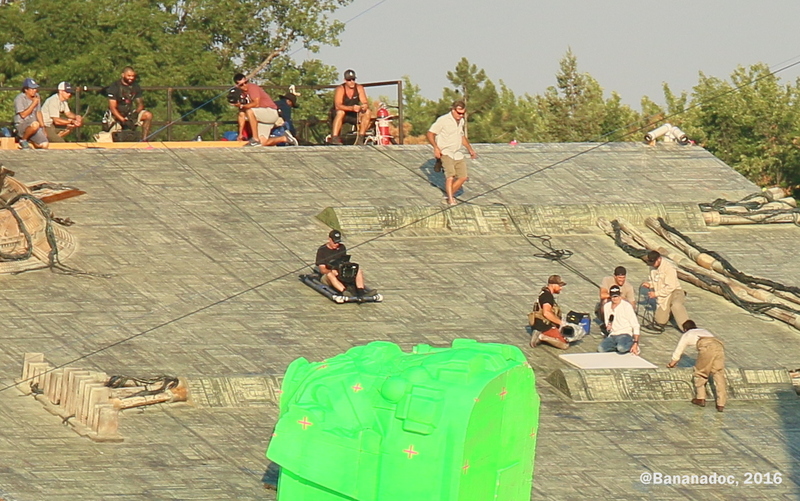 The real one is sprawled on the top of the green screen thing (aka autobot torso), and the stunt one is on the highest point of the raised platform. 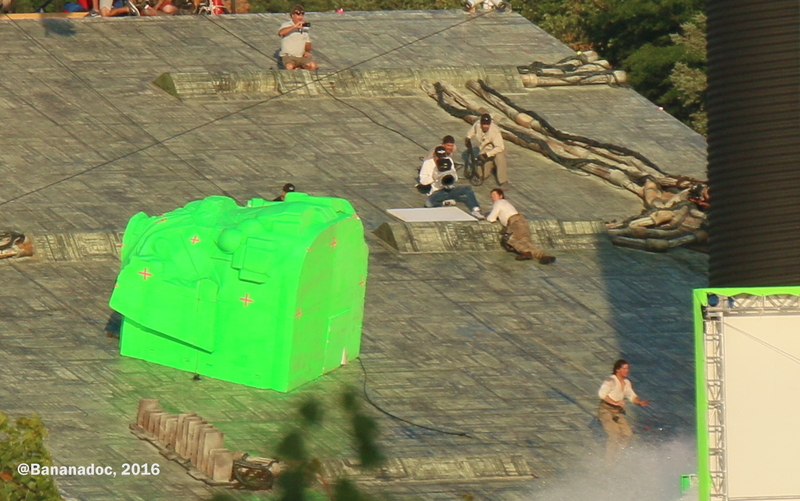 You can see Michael Bay in the white shirt with the camera in the structure at the top left. Watch the guy in the little camera car who drives down the slope to get a good close up of the action. Then the real action begins. I’ll put these shots into a slideshow so it’s easier to scroll through and see what’s going on. 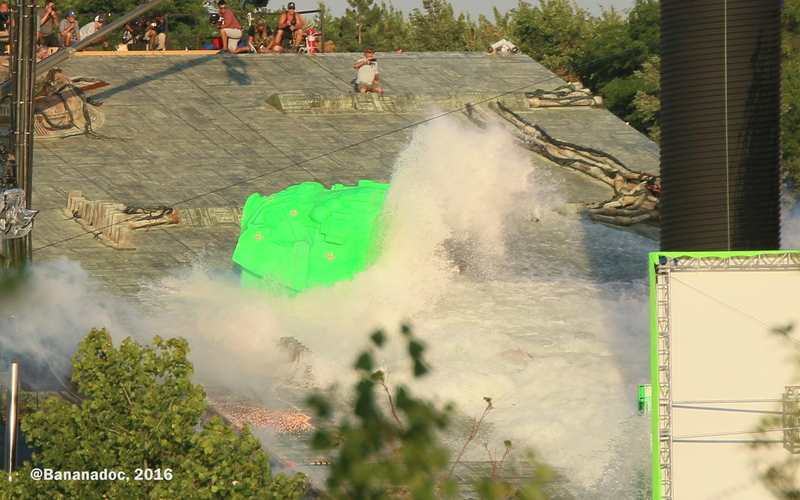 The scene starts with typical Michael Bay explosions, and then there’s a LOT of water. You can see it coming in from the right and washing across the platform to the bottom left. 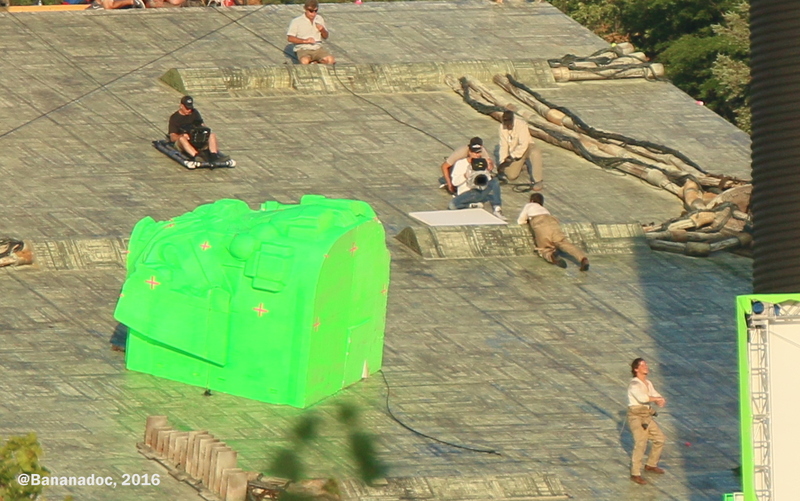 One of my favorite shots is this one of the crew at the top of the platform. Next time. even more action! I may even get these posted before the movie is released. 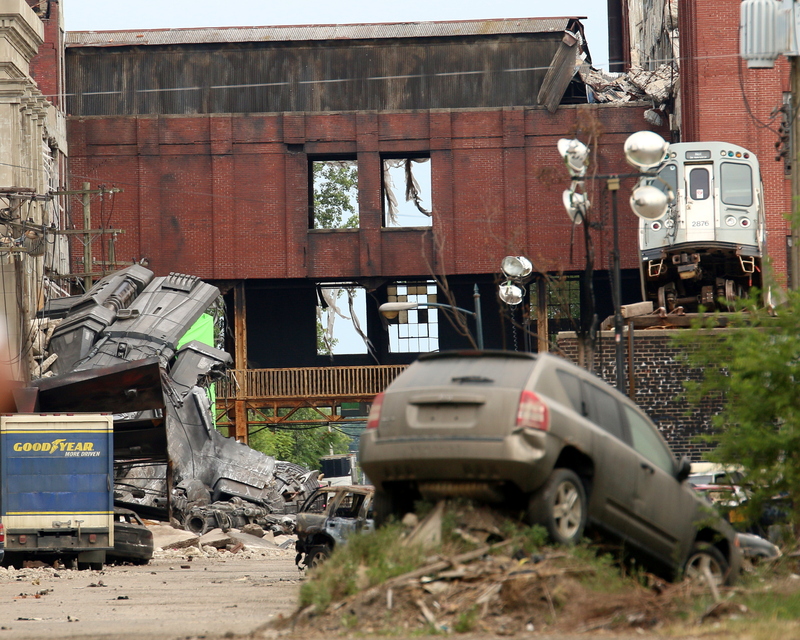 Early in July action started to ramp up in the backlot of the Michigan Motion Picture Studios in Pontiac. 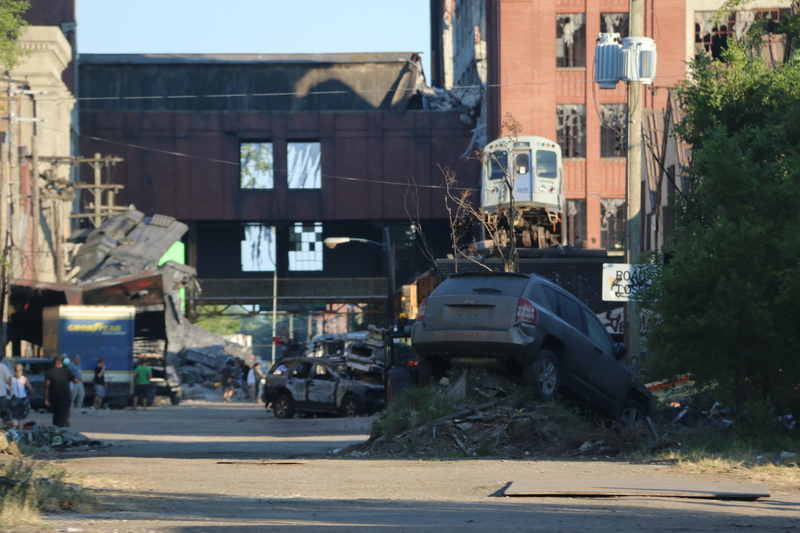 This wasn’t an easy place to see what was going on, but I managed to find a place with a pretty good view of at least some of the filming done here. And it was spectacular. We’ve already seen the result of much of this in the movie trailers, but watching the Bay magic up (relatively) close was incredible. Over the month and a half that followed I took literally thousands of photographs. To be honest, many of those are terrible. 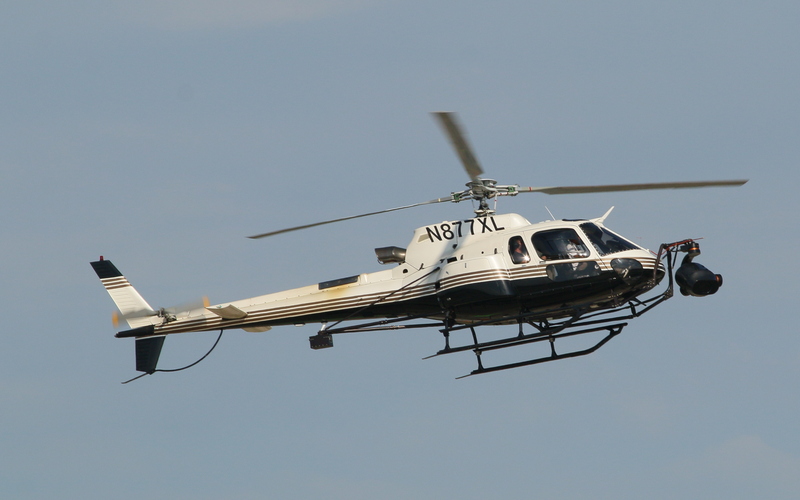 I was working at a huge distance from the filming, and I don’t carry around the sophisticated equipment of a professional, but I did what I could and begged and borrowed and rented equipment here and there. So some days were more successful than others! My view of the set at first wasn’t that great, but I thought it might give me some insight into what was going on and hey, perhaps I’d get lucky and see something cool. 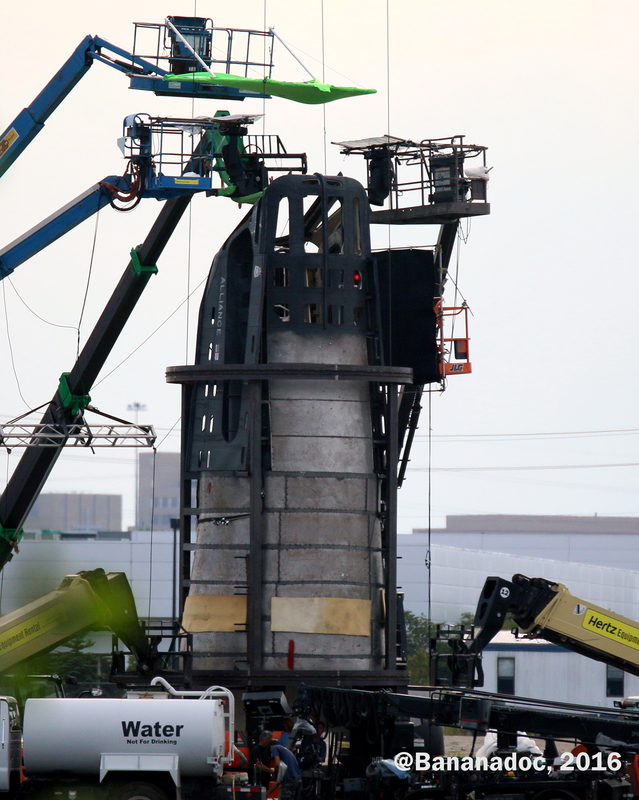 We’ve seen these towers before, and the platform in front of them. But when you zoom in there’s more detail on the platform. And that green screen thing? 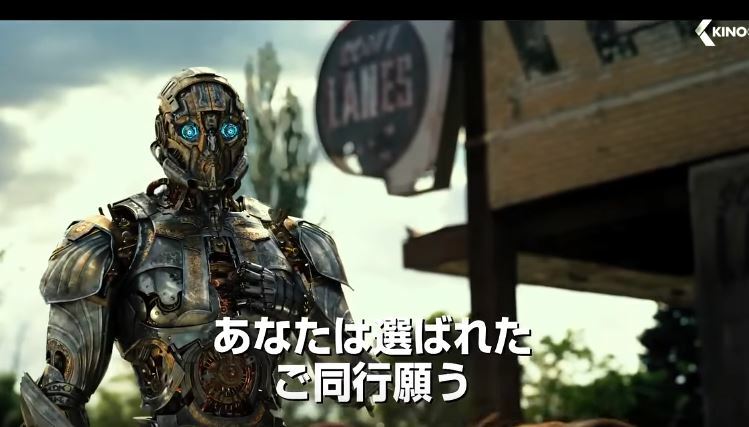 If you’ve followed my Twitter feed and blog you’ll know already that close up of the ‘green screen thing’ reveals that it is actually the torso of an autobot, most likely Hound. I literally saw this thing for weeks and didn’t work that out. When you see the trailers you’ll see the scenes I’m going to describe in the next couple of posts. 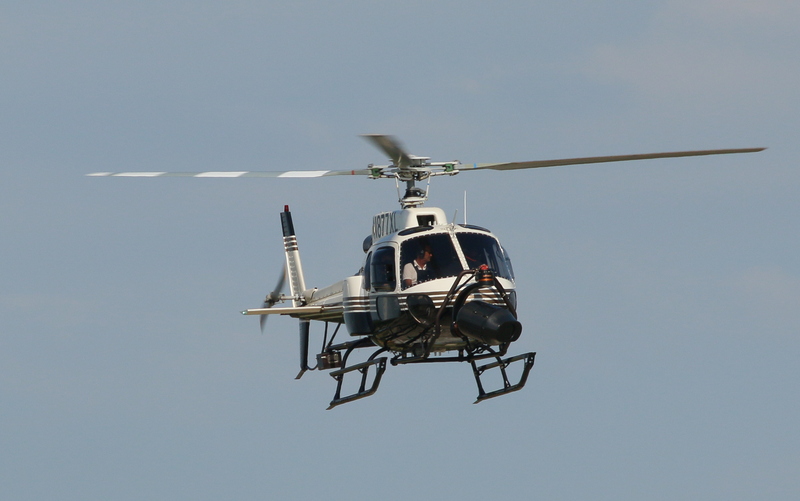 They get a couple of posts because the filming was pretty spectacular. Movie stalking is not an exact science. Unless you have a solid tip-off (and those are hard to come by), you never know whether you’ll be driving around for hours trying to find the set, or sitting somewhere for hours waiting for something (anything!) to happen that will justify this bizarre usage of your time. Sometimes you’ll watch a whole bunch of stuff being moved around, production crew setting stuff up and that’s all. I happen to love the whole movie package, so that’s OK. You’ll see I have hundreds more pictures of sets than I do of ‘celebrities.’ Yes, I’m happy when an actor turns up, but the sets and everything else that surrounds the actors is more important to me. So this was a balmy evening in July. I’m watching a lot of movement and then suddenly I see this guy. If Michael Bay is there, action will soon follow. So I’m excited. This set looks cool. But unfortunately from my angle and with that big green thing in the way and also the green screens, I’m not expecting to be able to see too much. Then I see a guy who looks a lot like Mark Wahlberg (to the right being fitted into some kind of harness). I’d see this guy a lot over the next month or so. I hope he was paid well! I was still cursing my obstructed view. Then I heard a siren. And then this happened. 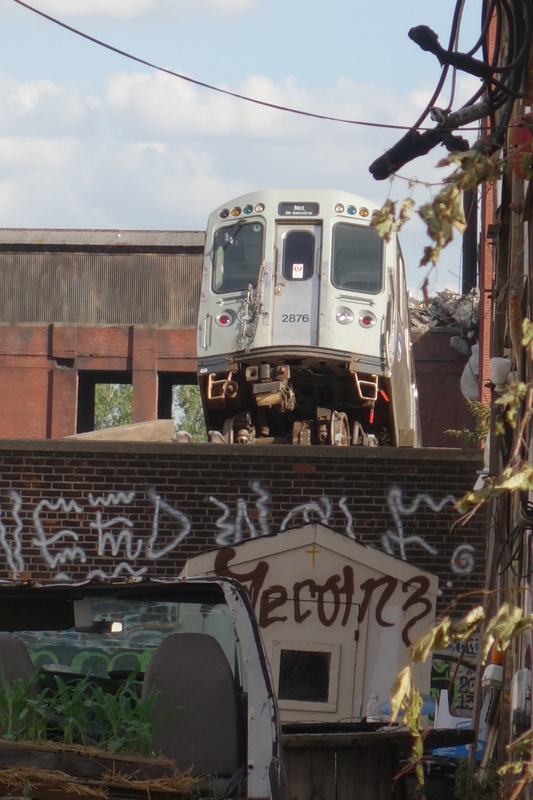 The platform lifted up. And up. I have the perfect view. 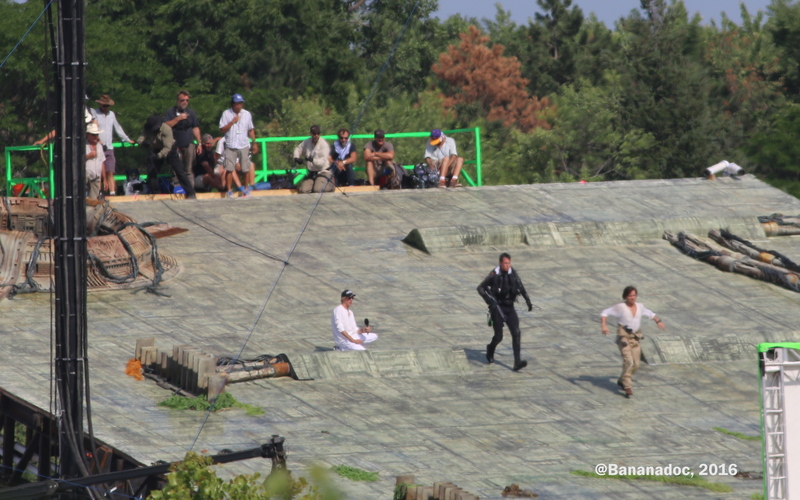 Stunt Mark Wahlberg is poised for action at the top of the platform. This is going to be fun. 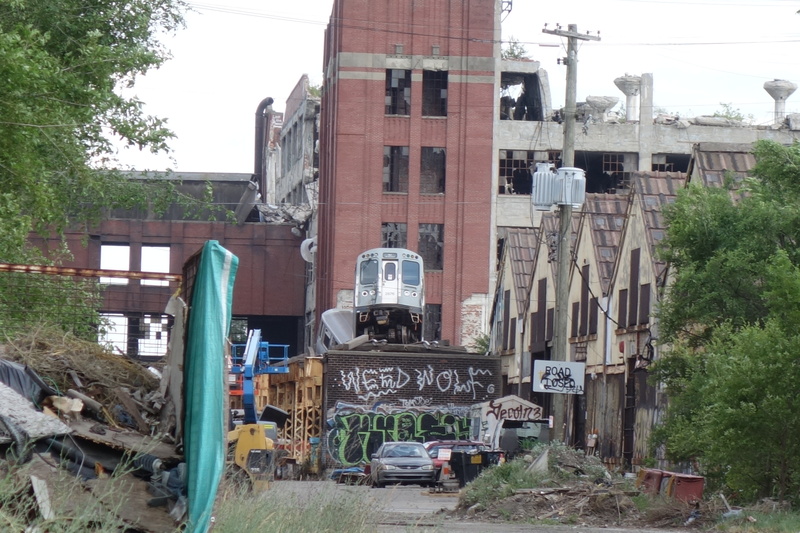 Sets were being built in and around the Packard Plant in Detroit for several weeks before anyone spotted them. It’s not a well-traveled area, so movement of trucks and machinery went undetected until these things started to appear on the side of the street. Even so, it’s more than possible that people thought these were just some kind of industrial equipment on another abandoned lot! 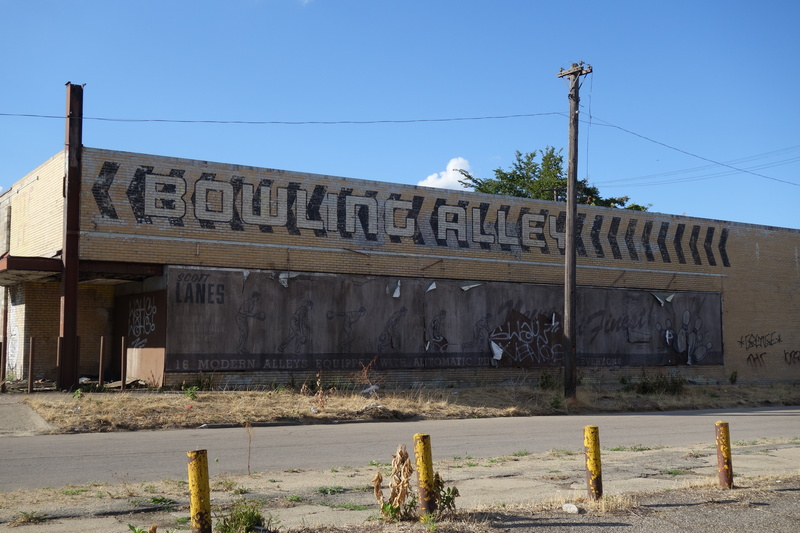 Once a few pics appeared on Twitter and Instagram, those of us who follow these things started exploring more around the Packard to find out what was going on. We’ve since seen at least one of these props in the movie trailer, shown here in a scene filmed in the now-abandoned Pontiac Silverdome. 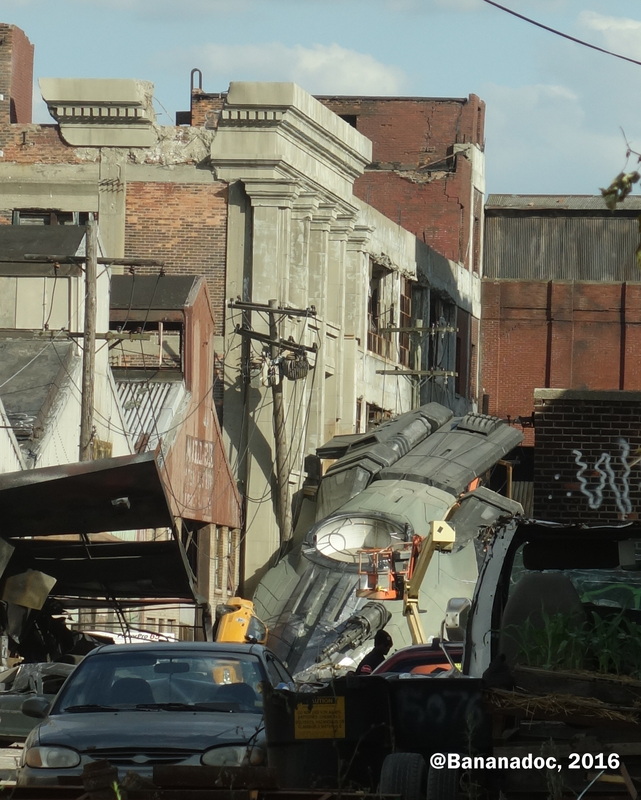 Meanwhile filming was going on in streets surrounding the Packard Plant behind impenetrable barriers. Believe me, I tried. Explosions, car chases, all that stuff, but all I got to see were the vehicles parked in the lots. Cool, but nothing to write home about.